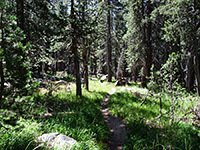 The Murphy Creek Trail is one of the less busy paths that begin along the Tioga Road, though receives quite a lot of use by backpackers heading to the Glen Aulin campsite - the trail is just a little longer than the usual route along the Tuolumne River (6.8 miles vs. 5.3 miles), and much more peaceful. The creek itself is a minor drainage, dry for much of the summer, and runs alongside the trail for only a third of the way; the remainder is through wooded land within sight of several granite summits including Mt Hoffmann, Tuolumne Peak and Polly Dome, while not passing close to any places of particular interest apart from one lake (McGee) near the north end and a couple of shallow ponds towards the south end. These are part of the Polly Dome Lakes, a collection of a dozen or so pools of varying sizes, the largest of which is particularly scenic, dotted with many granite boulders, and can be reached by a cross-country walk of half a mile. Murphy Creek Trail topographic map, Tuolumne Meadows trails. 14 views along the Murphy Creek Trail. The largest Polly Dome Lake. Full screen version (16 mb). The trails starts beside the Tioga Road half way along the north shore of Tenaya Lake; parking is either along the wide verges at either side of the highway, or at a picnic area just opposite. The path leads up a slope into thick lodgepole pine forest, running close to the boulder-strewn, granite-floored streambed of Murphy Creek. The woods are cool and moist, carpeted by grass, lilies and other wildflowers, and fairly shaded apart from the path itself, which creates an open, sunny corridor. 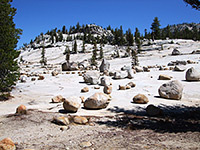 The route is never very steep and becomes almost level for a while as the trees give way to an expanse of pure white granite slickrock at the edge of Polly Dome, sprinkled with granite boulders deposited by long-ago glaciers - an unusual and photogenic landscape. Alternating patches of trees and more smooth slickrock are followed by a short steeper section at the head of the Murphy Creek valley, before the ground becomes thickly forested once more and the first of the Polly Dome Lakes appears. This is just a small, shallow pond right next to the path, edged by reeds and fallen pine trunks, but it makes a good place for a picnic, unless mosquitoes are present. Another small pond lies just east, and a rather larger pool is a little way south, accessed by a short hiker-made trail, indicated by a cairn at the junction. The biggest of the Polly Dome Lakes may be reached by following the course of the input stream (actually the far upper end of Murphy Creek) from the larger pool near the trail - an interesting walk of about half a mile over many boulders and fallen tree trunks, through quite overgrown woodland. 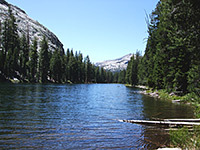 The creekbed curves round the north edge of Polly Dome and leads to a marshy area beside the lake, which is completely surrounded by trees and has granite cliffs in the distance to the south (Polly Dome) and west (Tuolumne Peak). The flat surface of the clear, shallow lake is punctuated by dozens of tiny rock islands, and the water near the shore harbors patches of thin reeds that form symmetric patterns, all creating a most pretty scene. There are several good primitive campsites along the western shore. Back on the official trail, after a junction with another route from May Lake and the Ten Lakes, the path starts to descend into the wide valley of Cathedral Creek, still through quite dense woodland. More granite cliffs and domes come into view as the creek approaches, then, on the far side, the path makes the short climb to long, thin McGee Lake, situated just beyond a saddle between two steep-sided hills. The last half mile of the Murphy Creek Trail is along the usually dry exit stream of the lake, down to a junction with the much busier Glen Aulin Trail, joining just 1,000 feet from the Glen Aulin campsite.